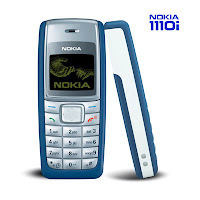 Have an easier play at life with the new Nokia 1110i. The black and white display with green background offers you a fresh outlook to staying in touch. Its as easy as one, two and three using the Nokia 1110i’s icon-based phonebook. Make a new friend, and let the Nokia 1110i’s MP3-grade ring tones tickle your senses before you say hello to someone new. Language support depends on location. The complete list of supported languages is presented below. Check with your Nokia dealer to see which languages are supported in your location. - Menu and predictive text input in English, Bahasa Indonesia, Bahasa Malaysia, Simplified Chinese, Hindi, Thai, Pilipino(Tagalog), Vietnamese, Marathi, Tamil, Gujarati, Bengali/Bangla, Telugu, Kannada, Malayalam, Punjabi, Sinhala.